This plant, which is illustrated by a cut, is an indigenous perennial herb, with a jointed, dark-brown root, about half the size of the finger, very fibrous, and internally yellow. The stem is simple, round, smooth, erect, about a foot high, dividing at the top into two petioles, from three to six inches long, each supporting a leaf. 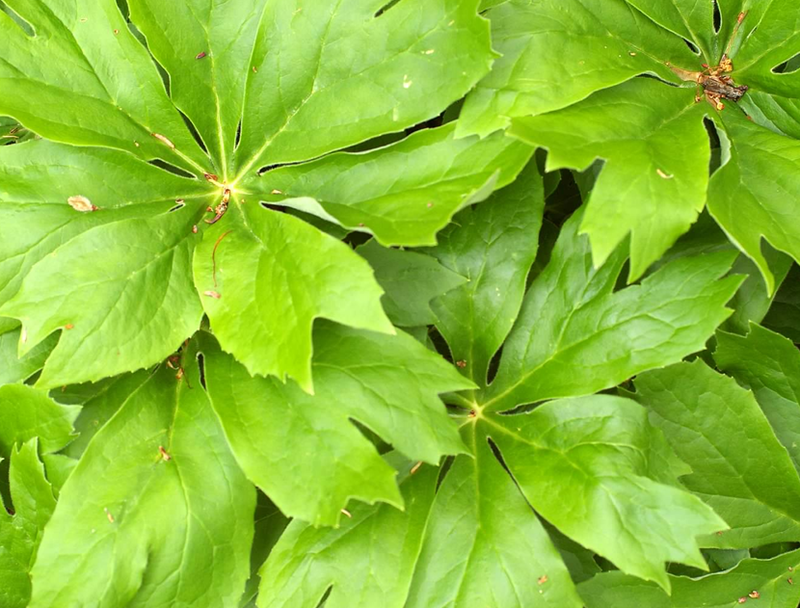 The leaves are large, palmate, oftener cordate, smooth, yellowish-green on top, paler beneath. The flower is solitary in the fork of the stem, large, white and somewhat fragrant. The fruit is fleshy, of a lemon color, and in flavor resembles the strawberry. There is another plant called mandrake, but which is the Atropa Mandragora, a plant belonging to the night-shade family. The cut I give of this plant is quite truthful. It is not used in medicine. It inhabits the shores of the Mediterranean, and found lurking in dark woods, in the gloomy thickets on the banks of sluggish rivers. It is fetid, poisonous, and repulsive. Even its golden fruit has this nauseous odor. How, then, came it ever to usurp its dominion over men? Its strong narcotic powers may have had some influence; but the peculiar form of its root, in which the resemblance of the human shape as will be observed, is quite apparent, probably led to its use in magic. In popular belief, it became invested with half-human attributes; and cries and groans attested its pain when torn from the ground. Gathered with peculiar rites under the shadow of a gallows, it caused money to multiply, but death overtook the daring searcher for mandrake who committed an error in the ritual. There is nothing new under the sun, and as no small number of the old-time magical effects are renewed under new names, our book may reach some spot where the mandrake has been brought forward by some new schemer, and play its part in deluding the silly.